Has the Niche Market for Kitty Litter Reached Saturation? Pyramid Mountain Lumber Company’s “I think I can” attitude has kept the mill in Seeley Lake, Mont., competitive in an age when other Montana mills have dropped out of the race. In Missoula County, which once boasted 22 mills, only Pyramid Mountain remains today. The family-owned company, founded in 1949, had to be gutsy to move forward. Pyramid’s chief operating officer, Loren Rose, recalls November 7, 2001, as something of a do-or-die time, as the company sent 60-day termination notices to its employees. Once the planned shutdown hit the news, the phones starting ringing. “People were calling, asking what we needed to keep going, and we told them we had to have more efficiency in the sawmill.” Rose commends Rod Leese of the local Two Rivers Bank as being the ambitious force that started assembling the funding for equipment upgrades. The bank, with its understanding of rural enterprises, teamed up with USDA Rural Development and other sources, to finance modernization of Pyramid Mountain’s outdated mill. Soon after funding was secured, the company located two key pieces of equipment, both nearly new, at a Sierra Pacific mill in California. Sierra Pacific owner Red Emerson made things happen to seal the deal, and Pyramid Mountain got back in the action. 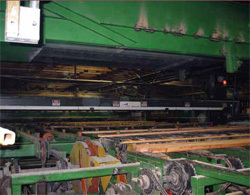 Adding to the previous purchase of a Newnes (now part of USNR) optimized trimmer, bought and installed in 1999, the company was able to install the Newnes curve saw gang edger and optimized board edger to make the mill flexible enough to turn out several competitive products. It didn’t hurt the company’s fortunes that successful logging contractor Charlie Parke also stepped up to invest as a 40 percent owner, helping keep a steady supply of logs flowing into the mill. To get the full picture of Pyramid Mountain’s reinvention, it’s useful to travel back in time. In 1979-80, the mill chose to be a board mill rather than a green random length, random width dimension facility. Designed to cut everything from a 1 x 4 to a 2 x 12, the mill could process up to 20-foot lengths, churning out an entirely different line of products from the standard green dimension mill. 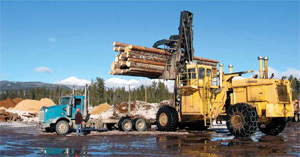 Approximately 35 truckloads of timber per day keep the operation running. The mill processes five million board feet of wood products per month. At the time, the focus was on Douglas fir, lodgepole, and Ponderosa pine. If the mountain pine beetle was boring into lodgepole and wood was plentiful, the company cut 60 percent lodgepole. “It is that ability to be flexible that creates opportunity,” Rose summarizes. The choice to be a board mill kept the company humming with two shifts and two outreach forestry offices to keep the wood basket full. To stay flexible, the company built a mini-mill in 1993, hoping to recover some value from whips, pulp, and other small logs. By 1994, a building was up and equipment was in, but what seemed like a good idea at the time proved not to be successful, and the mini-mill was shut down in 1997. With debt starting to mount and fortunes in timber dwindling, Pyramid Mountain turned to the Beck Group for a better strategy. Beck’s in-depth study advised the company to invest in new equipment, the goal being to purchase four key pieces at the rate of one piece per year. Balancing a tight budget, the company auditioned equipment manufacturers, choosing a Newnes optimized trimmer as its initial purchase in 1999. The choice was based on the ability of the machinery to fit into the mill’s established configuration. Also, Newnes had its training center at Salmon Arm B.C., making training convenient. Although the equipment upgrade helped, the red ink was spilling faster, and company leaders had to stop the bleeding. In a town where the sawmill was the lifeblood, community leaders were also often mill employees. Some had been with the company as far back as 1952. Montana had already lost its luster as a timber state with mills closing left and right. The huge wildfires of 2000 and 2003, however, reminded even the most stalwart environmentalists that some timber infrastructure was still needed. Thus, there was no major outburst when county, state, and federal officials put together the $4.6 million loan and credit package in 2001. It brought the company out of the woods, so to speak. Over the years, the team at Pyramid has stayed close to 150. 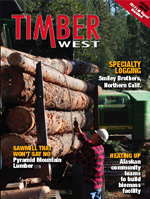 The sawmill runs 50 hours a week and the planer employs two shifts with an 80-hour a week schedule. Debt restructuring and the fortuitous equipment purchase from Sierra Pacific pumped life back into the company. The fourth piece of equipment targeted to keep the momentum going was a small log mill, purchased late in 2006. A USNR end-dogger with full-scale optimization was installed, completing the Beck Group’s ambitious to-do list. “We had been doing our research for many years and knew several machines would do the job,” Rose says of the small log mill, adding that the company had purchased a used Albany twin band in the late 70s when they converted to a board mill. 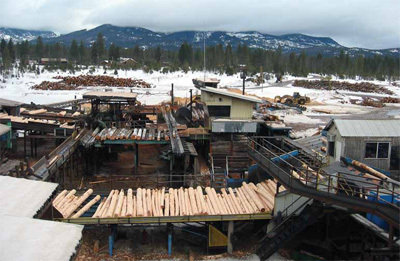 Throughout Pyramid Mountain’s reinvention, the crew of 150 has stayed somewhat constant, and today the sawmill runs 50 hours a week, while the planer employs two shifts with an 80-hour a week schedule. Thirty-five truckloads of timber per day keep the operation running as the mill processes five million board feet of wood products per month. As the number of Montana mills has dwindled to nine (not including mom-and-pop/post-and-pole operations), Pyramid Mountain has stayed alive, cranking out hundreds of different products. The weakness of the U.S. dollar has allowed the company to ship its range of products to the southeast, and area beetle-kill and wildfire damage have kept the saws humming. It’s that ability to turn on a dime that helps the cause. Clearly, choosing to become a board mill was a wise decision. The dedicated workforce has also made a difference. “It’s our people,” Rose says. “We wouldn’t have made it without them and their ability to work hard and stay focused.” Having logging contractor Charlie Parke join Pyramid Mountain’s Roger, Steve, and Todd Johnson, descendants of one of the mill founders, as part of the ownership, has helped keep up a steady wood supply, as Parke Logging navigates the woods and brings in the logs. Because the company has no land of its own, wood sourcing is key. Gaining Sustainable Forest Initiative (SFI) status adds another plus, keeping the company’s image squeaky clean. Pyramid may not be as streamlined as a stud mill, but with one-third the workforce and a smaller log yard, it boasts unrivaled variety. Loren Rose approves of the I-think-I-can description, outlining some of the company’s recent versatility in action. There’s the blue stained wood that under many circumstances would go begging. When the European spruce couldn’t compete in the southeast due to the strength of the Euro, the company parlayed the advantages of the dollar and sold blue stain products into the southeastern region. “Customers looked at it, and because it was going to be painted, the blue stain didn’t matter,” Rose says of the product, which has also sold well as tongue-and-groove. Another recent coup for the company was cutting 75 columns (16’ x 12” x 12”) for an upscale house. “They contacted us about the job and we could say, ‘Yeah, we’ll cut 75 timbers for you,’ because of our flexibility,” Rose says. While stud mills can be much more streamlined, Pyramid Mountain can boast unrivaled variety, with one-third the workforce and a smaller log yard — not a bad thing when the housing market is down. The pine shop boards, all created in varying lengths, don’t have to be uniform to be sold for sashings, doorframes, and furniture parts. While some of the variety demands more employees to inspect for quality and utilization, opportunity knocks when a sawmill can routinely run such specialized items. Saws can be adjusted when beetle killed Ponderosa dumps onto the market and readjusted when something else develops. It’s not always a cakewalk, even with equipment upgrades, and again Rose points to the people part of the equation. When three of the last eight or nine winters have brought economic uncertainty, the mill has made agreements with loggers to withhold some level of payment until the logs were cut and processed. “We’ve had to be upfront with loggers and say we can’t pay right now,” Rose says. “We’ve just had to do it this way and hope the loggers assume some of the risk.” In hindsight, the cooperative agreements have worked, with everyone getting paid. But again, it’s flexibility and trust that lead to survival.